Disclaimer: pizza aficionados, I'm sorry. I've taken a bit of a liberty calling this a recipe, idea might have been better..! As nectarines were coming to the end of their season I started to panic. In my house a bit of a peach and nectarine addiction takes hold every summer, you will find them everywhere and in everything. Even in my sisters bedroom where we hide them from my dad who eats them before they're perfectly ripe! 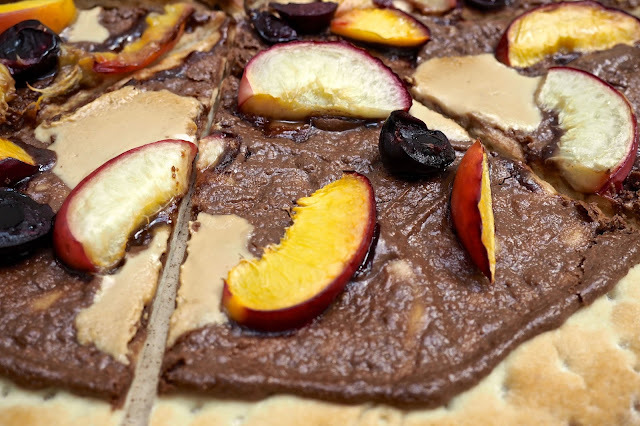 I came home from a job I was doing with lots of pizza bases, cherries and nectaries and thus the chocolate pizza was born. 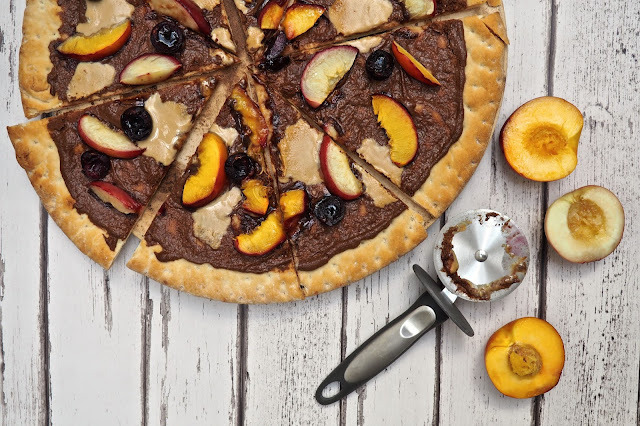 Slice peaches, cut cherries and throw on to a pizza base covered in Nutella. Blob with some fancy white chocolate hazelnut spread and bake at 200 degrees celsius for about 10 minutes. Obviously this is just one variation on hundreds that would work. 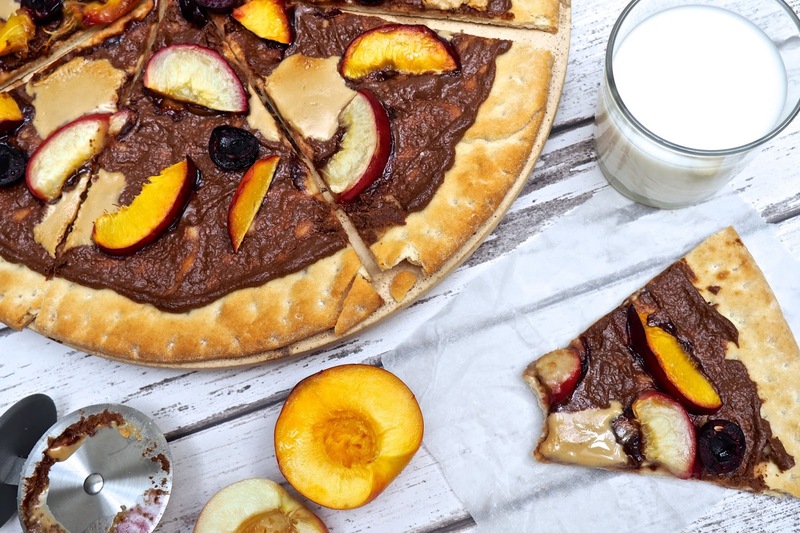 Just think chocolate fondue pizza. I went for nectarines and cherries but you could use anything you like. Strawberries and bananas, blueberries and ricotta (hmm, might have to try that) or if you have a particularly sweet tooth go mad and get some marshmallows and Oreos thrown on there. Whatever you chose to top your pizza with tag me on Instagram so I can see it and serve with some cold milk and a bad movie! 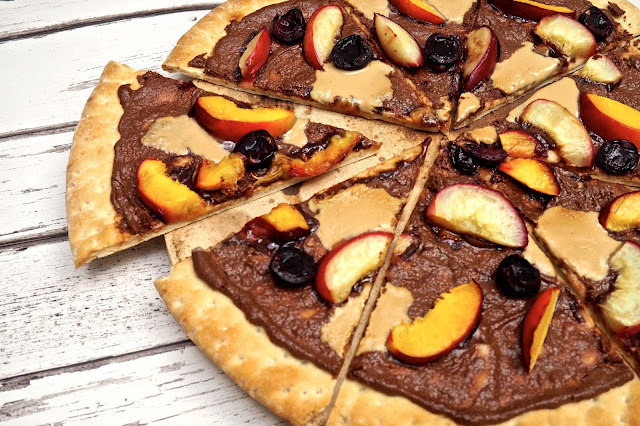 I've never seen a sweet pizza with fruit on it before, most of them have even more sweeties piled on top as topping so this looks semi-healthy! Yeah it's totally one of your five a day...!